Wirral Civic Mayor, Geoffrey Watt, cut the blue ribbon in front of a hundred guests and visitors on Wednesday 2nd April to celebrate the fantastic work carried out on the park by the Land Trust and Autism Together, which manages the site on the Land Trust’s behalf. 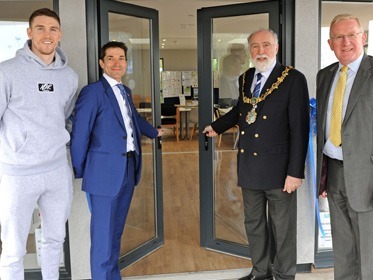 Building work on the site’s heritage centre began in September 2018 and was carried out by Building Projects Group LTD, and their managing director, Adam Bell, was in attendance at the event. The new centre forms part of the National Lottery Heritage Fund supported project, Discovering Bromborough 3. During the event, families enjoyed nature trails and seed planting, whilst a display of the artefacts from previous years’ excavations was shown by project partner Big Heritage. VIPs were also in attendance thanks to Building Projects Group LTD, with super-middleweight champion boxer, Callum Smith, showing his support. “We were delighted to be able to officially open this fantastic facility to park users and the event was a wonderful celebration of a lot of hard work and dedication from some fantastic organisations to make it happen. “Since the Land Trust took ownership of the site in 2014, it has been transformed into a wonderful community asset that delivers a whole host of environmental, economic and social benefits. The heritage centre will be an excellent base for educational activities and we will be working with local schools to bring children to come and learn about the environment and appreciate the benefits that spending time in green space can bring. Port Sunlight River Park is a former landfill site that was transformed and opened as a public open space by the Land Trust in 2014. Since its opening it has developed into a popular tourist attraction which adds significant community benefit to the local area.